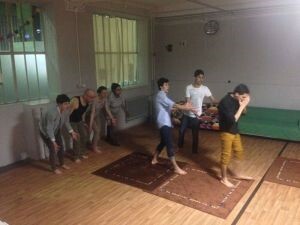 Thanks to Alexander Shroeder, a theatre professor and an avid theatre practitioner from Berlin, I was recently able to lead an applied theater workshop with three core members of his new theatre company, one that is formed by young refugees who are temporarily located in Berlin’s Tempelhof Airport. Tempelhof, which was largely built by the Nazi government, ceased its airport operations in 2008 and has now become a refugee center with a plan to house up to seven thousand refugees, which makes it one of the biggest, if not the biggest, refugee centers in Germany. The three members of Shroeder’s company were asylum seekers from Syria–—Abed, 17, from Deir al-Zour; Mohamad, 16, from Marj al-Sultan; and Odai, 17, a Palestinian who was born and raised in Syria. Alexander’s work with these three youths as well as others began in late winter 2016, when he worked with them and the assistance of Raghda, a translator, using theatre as a tool to address their issues, their lives, their escape to Germany, and their dreams. To them, Alexander is more than a theatre facilitator; he is a mentor, a big brother, and a bridge between them and the German community. On our first day, one of them, Mohammed, told me his story. He made several attempts to journey from Turkey to Greece on a floating boat, being stopped by the coast guard twice before finally succeeding and walking the rest of the way to Germany. Abed was luckier, arriving in Greece after only one attempt. Odai was detained and tortured in Syria before he decided to run away. Alexander then joined us, accompanied by three Germans who were curious to meet and support these three youths. I felt that it would not be comfortable to conduct a workshop with three participants and four observers, so I decided to include everyone in the room in the workshop, including Raghda, the translator. The Germans took off their shoes and we all stood in a circle. During my extensive work with refugees in similar workshops, I began to see a pattern for most of the boat stories that I heard: refugees find their way to Turkey; they contact a smuggler; they are housed somewhere close to the sea; and they make “muhawalah,” an attempt, to cross the sea to Greece. If they are lucky, they arrive in Greece on their first attempt. If not, they are caught and returned to Turkey, and try again, repeatedly, until they reach Greece. While they wait close to the sea, they live in small, cramped apartments, which they might share with up to ten people. Until they get a call from the smuggler to go to the sea, they are not allowed to leave the apartment for two reasons: (1) the Turkish police might suspect that they are potential asylum seekers—the Turkish police have actually invaded some of these apartments—and (2) these souls are actually on alert, meaning that at any minute—it might be 2:00 a.m. or 3:00 a.m.— the smuggler might announce that the car has arrived and that they need to move immediately. At the coast, one struggle ends and a new one begins. They must wait, sometimes for hours, maybe days, until they get a green light from the smuggler to get on the boat. They lack food, water, and hygiene facilities. The boat, which is supposed to be the most dangerous part of their trip, is to them a salvation—they anxiously wait the notification to go on board. The media has been selective and providing us with only one part of the story, the boat story, while ignoring the traumatic events experienced on the journey to the boat. Perhaps this is because the boat story is more sensational since it contains potential drowning and death, much more sensational than covering people crammed into a small apartment awaiting a signal from a smuggler. If they successfully complete the boat crossing and the epic journey through Europe to Germany or another place of refuge, they are placed under a different kind of stress. Crammed into a refugee center, they wait for weeks, months, perhaps even years, for the paperwork allowing them to move forward. A reasonable percentage of those asylum seekers hold university degrees, are laborers, and others who are eager to become active participants of their host community. Instead, they have to wait with no end in sight. While they are waiting, they pass the time with activities such as the one Alexander is doing voluntarily; in his case, creating theatre classes, and maybe a theatre company. Back in Tempelhof, I use theatre games to help them to capture and deal with their harrowing experiences. They create frozen images concerning injury, departure, and eventually hope. Here the asylum seekers struggling for relief and the Germans trying to express their sympathy and eagerness to help. In their eyes, I saw determination, hope, and resilience. Changing the course of their lives was not easy, is not easy, and will not be easy, but it all begins with visualizing, imagining, and articulating their dreams, and for these young refugees, the workshop offered a way be begin that process.